Kristi and I recently returned from a trip to Boise for my niece’s bat mitzvah. As this event took place over the Fourth of July holiday weekend, we had the pleasure of experiencing fireworks they way they do them in the great state of Idaho. You might think fireworks are fireworks, but it ain’t necessarily so. When I was a little kid growing up in the San Fernando Valley, we were able to purchase fireworks from a variety of places and set them off in the street. At some point, most fireworks sales to the public were outlawed — something about kids inadvertently losing fingers and eyes, I think. The nanny state strikes again. Today in most parts of Orange County, you can neither purchase fireworks or legally set them off. I can understand this restriction in the area where we live, because our home rests up against a mountain and the area is prone to forest fires. In fact, the 2007 Santiago fire almost burned down the whole neighborhood. As a result, fireworks are more or less limited to professionally designed and executed displays sponsored by cities and towns around southern California. In Boise, on the other hand, there are far fewer professional fireworks shows. Instead, denizens of the town can purchase fireworks — legal and not-so-legal — and put on their own shows out in the street. It probably doesn’t hurt that a big pyrotechnics factory is located near Boise. I’ve never seen Kristi so excited as when she realized there were fireworks stands on every street corner! We spent the evening of the 4th with people who really love things that explode. I heard estimates of well over $1,000 spent on Roman candles, bottle rockets, bursts, fire flowers, sparklers, and some of the largest mortars I’ve ever seen on a city street. The firecrackers may not have been quite as large as what the professionals launch, but we were only 20 feet away from where these were being lit, so the effect was greatly magnified. By the end of the evening there was so much firework detritus on the ground that one could hardly see the surface of the street. I feel for whoever had to clean all that up the next day. 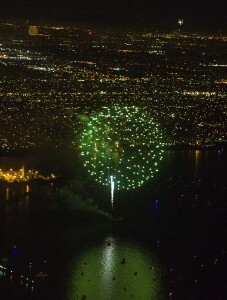 Back home, I don’t mind the lack of publicly-available fireworks because the pros do such a bang-up job. It’s also safer. The only downside is that I don’t like crowds, and nothing causes people to congregate like a pyrotechnic show. 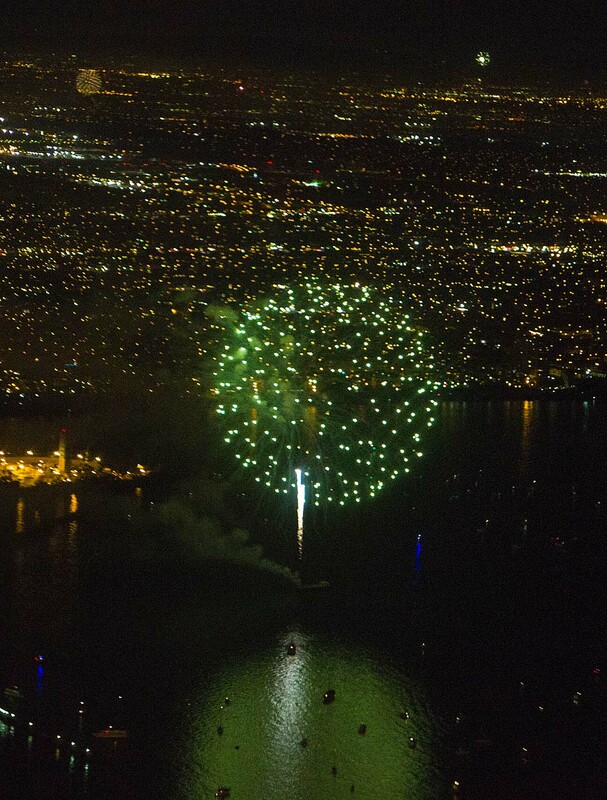 Anyway, on any given 4th of July, you’ll see dozens of major fireworks displays all across the Los Angeles basin. The best way to experience these shows is, of course, from an aircraft. 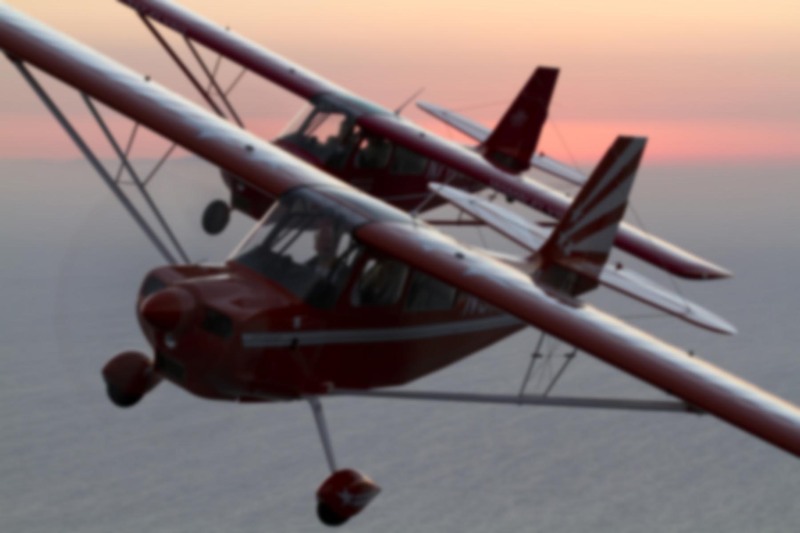 In the days when I owned a Skylane, I’d take friends up on the 4th of July and we’d cruise up and down the coast at 1,500′ at around 8:30 or 9:00 p.m. Instead of seeing one fireworks show, we’d see them all. And if any scofflaws were setting off fireworks on the streets below, we’d see those as well. The Skylane was particularly well-suited for this sort of thing, because with the wing located above the fuselage instead of below it, you’d have unlimited ground visibility. It was able to fly slowly (I used 60 knots with full flaps), quietly, and with the windows wide open we could sometimes even hear the explosions over the sounds of the wind and engine. 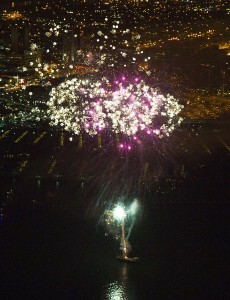 Nothing says “America!” quite like fireworks and aviation. I always try to capture firework on “film” but rarely succeed in producing anything worthwhile. You probably know what I mean. Point-and-shoot cameras combined with rapid motion and low-light don’t exactly result in crystal clear photographs. With the inherent delay built into the shutter button on most non-SLR digital cameras, it’s a crap shoot. Thankfully, I have something better than a good camera: a good friend who has a good camera and knows how to use it. Dean Siracusa generously allowed me to post a few photos he took from his own aircraft, a rare Meyers 200, while doing the 4th of July aviator-style. 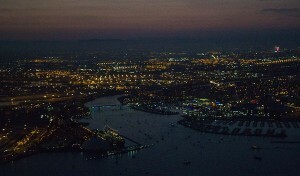 Went with two friends went for a flight over Los Angeles last night to see the fireworks. Lots of fun! Surprisingly, even the professional fireworks do not go very high. I’m guessing that they went no higher than 600 feet. We stayed at 1500 feet and had an amazing view. It’s hard to see from these pictures but there were fireworks going off throughout the entire Los Angeles basin. Amazing! 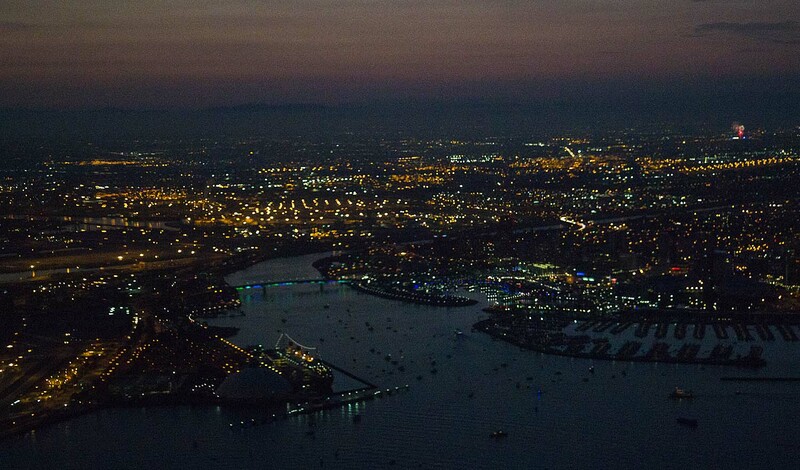 Very nice, but you can get almost the same thing on the extremely tall HOV lane transition from the 105 to the 110 as you drive through non-stop illegal aerial fireworks. Probably not a good place to stop the car. As for the illegal fireworks, I’m surprised about that. I hardly ever see them around anymore. Can I just say that Idaho is a beautiful state and I would definately recommend going there! I flew over Idaho in a business jet the other day and Idaho is stunning from the air! No low flying fireworks tho!